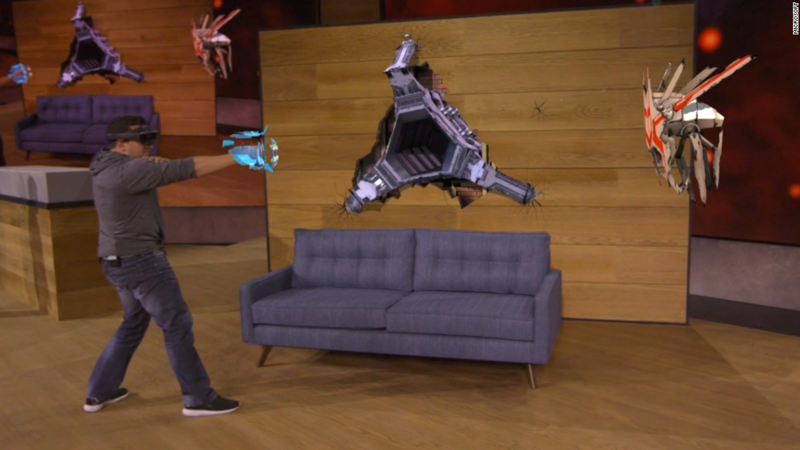 Want to try out Microsoft's HoloLens? Get in line. Demand to play around with Microsoft's new hologram headset is off the charts, so Microsoft has created a space in its new Fifth Avenue flagship store where people can come to experience it for themselves. Before you start pitching a tent outside Microsoft's store, it's not exactly open to everyone just yet. You'll have to be a software developer, and you'll have to add your name to a long waiting list. 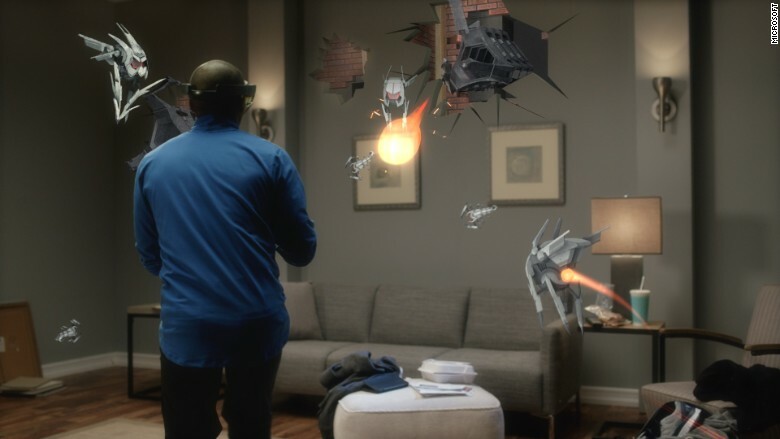 Microsoft (MSFT) has made HoloLens available to app makers in the past. It announced an 11-city road show earlier in the year, which sold out within minutes. So HoloLens now has a permanent home in New York, where developers can get in a virtual line to test out the technology. The experience takes people through three rooms, each with a different scenario in which HoloLens might be used. In the first scenario, HoloLens wearers get to design a 3-D ocean scene and an X-wing fighter from Star Wars. The holograms appear around the room, and people can move them around, paint them and change their sizes. Another scenario is a video game that takes place around the room. Alien robot drone things bust through the walls, and you have to shoot them before they shoot you. In the last experience, HoloLens wearers develop a presentation for potential customers, including a 3-D watch, a 3-D map and an impressive 3-D view of the solar system. As you walk around the holograms and even look underneath them, HoloLens instantly shifts the perspective so it appears as though the "objects" are three-dimensional. HoloLens wearers control images with their gaze and with "air taps," which are akin to mouse clicks. Despite the HoloLens experience, Microsoft is still keeping HoloLens very close to the vest. 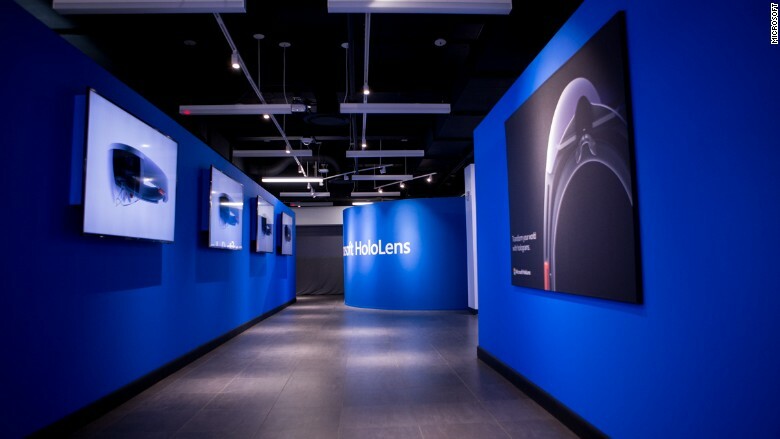 The HoloLens Experience is on the fifth floor of the store, which can only be accessed via a side door and a long series of locked doors that require special badge access. Even the elevator requires a badge to ascend. Microsoft said HoloLens will eventually come to consumers, though it hasn't yet announced a date for its release. A developer's edition will be shipping in the first quarter of 2016. But if you want to see what a HoloLens looks like for yourself (without trying it on), Microsoft has one on display in a glass case on the first floor of its Fifth Avenue store.